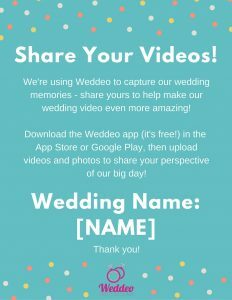 You’ve chosen Weddeo to create an amazing wedding video – hooray! 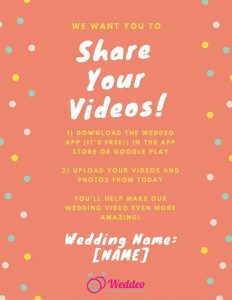 We’ve created two free wedding printables for you to choose from, to help your guests know that you want them to share their videos from the Weddeo app (and how to do it); you can customize them with your wedding name – the unique wedding name that was provided to you after you purchased your Weddeo package – and print as many as you’d like to place around your ceremony and reception locations. Click and save your preferred printable (make sure to save it as a PDF!) 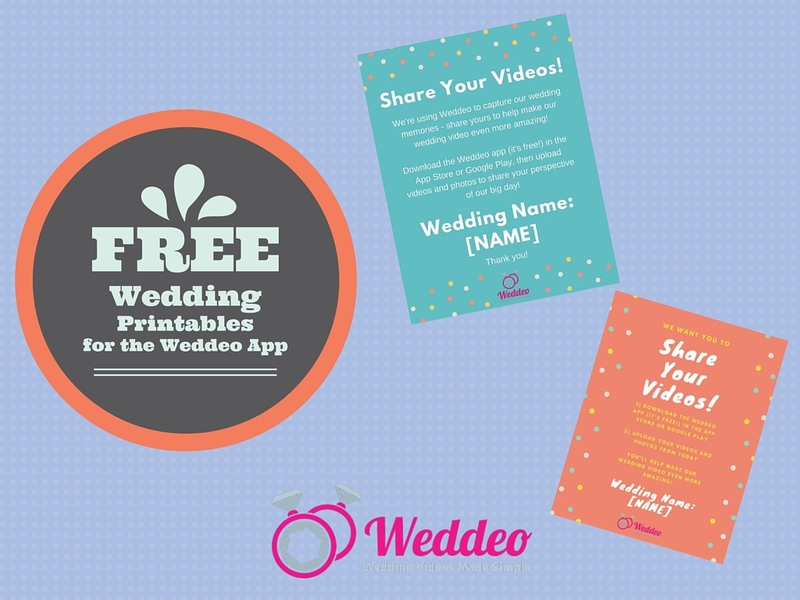 – you can choose from Weddeo app printable – blue or Weddeo app printable – pink. You can choose to hand write your app code or follow the directions below. Open the PDF in Adobe Acrobat; if the program is not already on your computer, you can download the free version here. Print the customized version – as many as you’d like! This was created to print as a full sheet of paper (8 1/2″ x 11″), but you can also print this out smaller using your printer’s settings, if you’d prefer. You can also save the customized version to your computer (probably a good idea either way, so you can access it later, if you’d like). And if you want to get meta: Snap a picture of the sign on display at your wedding (or ask a guest to do this) and share it on one of our social channels! We can’t wait to see how you’ll use these! 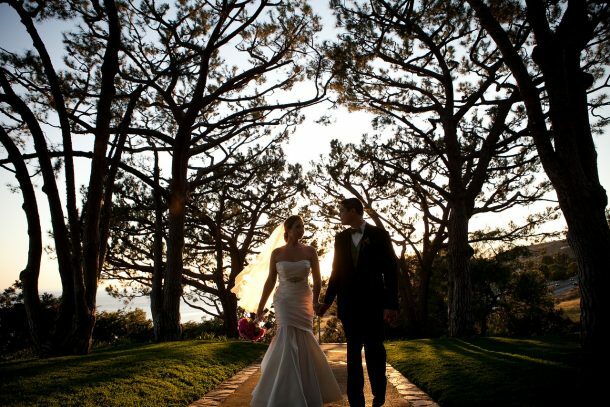 Still deciding on which Weddeo package is right for you? 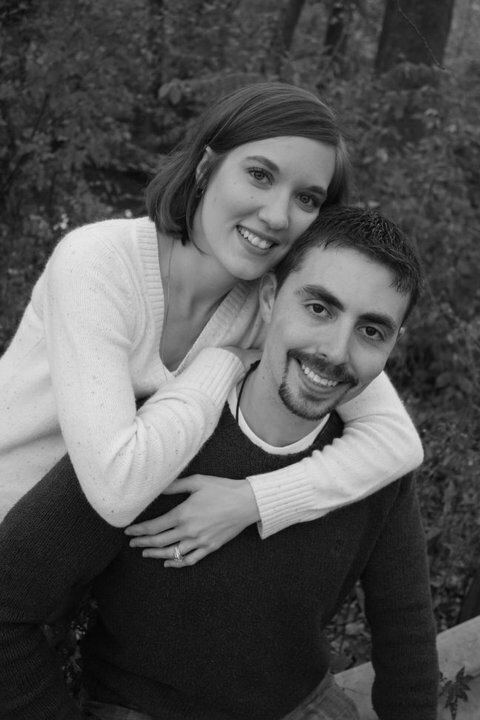 Learn more about our packages and pricing and how Weddeo works!